Does “real impact investing” have to mean achieving market-rate financial returns? Or does achieving impact require sacrificing financial return? A cursory read of impact investing news might leave you confused. On one hand, studies have shown that impact can be had alongside market-rate financial return. Conversely, it seems intuitive that systemic poverty would be difficult to address without sacrificing financial return at some level. As one expert points out: “Those promising comfortable market-rate returns while solving global poverty are the equivalent of diet gurus promising that one can lose weight while eating limitless amounts of chocolate cake.” Cite Without clarity, we can’t know what to expect when entering into impact investments; lack of clear expectations will almost always lead to disappointment. That’s why we've developed a framework that can help make sense of the interplay between impact and financial return. We have seen hundreds of companies tackling a wide range of issues through business models as diverse as bus seat manufacturing, hydroelectric power, software development, and a cattle feed lot. Likewise, the potential return for investors is equally varied. It may be helpful to illustrate the interaction between profit and positive social outcomes on a simple X-Y axis. Where profit is high and the company is harmful to the environment, employees and/or the community, we call it exploitive. Organized crime syndicates, drug deals, and blood diamonds provide examples in the far upper left. Operations with no profit and negative impact fall in the bottom left corner as wasteful. At the risk of provoking an argument, there may be a failed government program or two that fall into this quadrant. Organizations that provide great social/spiritual/environmental impact without profit are considered charity. Without donations, they would not be sustainable. Certainly these programs are worth supporting with our grant funding, but they would not be considered impact investing. Sustainable impact happens when financial operations are profitable and the social/spiritual/environmental impact is positive. All enterprises, regardless of tax status, produce both social and financial results, on a spectrum from positive to negative. Their financial and social performance is measureable and varies over time. Every organization from the simplest nonprofit to the largest multi-national conglomerate can be assigned a place on the chart. Kingdom Impact Investing involves placing capital in enterprises to achieve positive social/environmental/spiritual outcomes alongside financial profit. Investors may choose to take a lower financial return if the expected impact is high. For example, a friend of ours provided a zero-interest loan to charity so it could acquire new land in Uganda to expand its Christian school. When asked why he would make such a risky investment with no interest, our friend replied: “the last time I did this I lost everything. It was called a grant. If I could get even a portion of the capital back to give away again, that would be a win.” On the other side of the oval, companies with strong financial return may not provide social/spiritual benefit as strong as a charity, but are worthy of impact investing capital. Their profits can fuel further giving for investors. 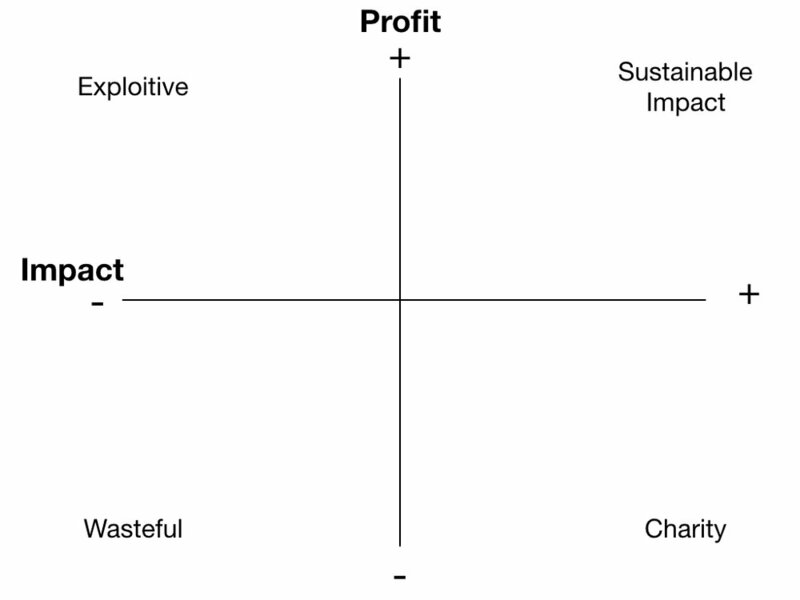 In the top right quadrant, sustainable impact happens where the core economic activities also advance the mission and provide sufficient operating funding. 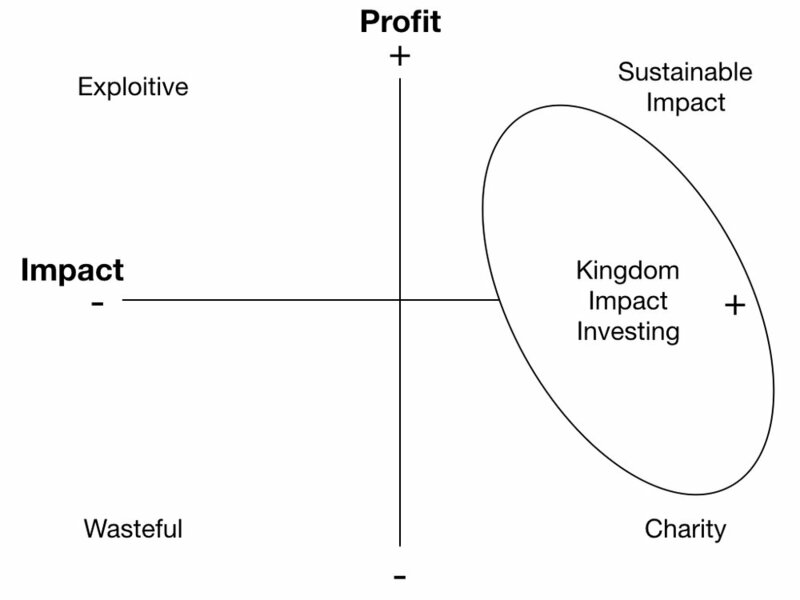 But the hope of Kingdom Impact Investing lies even beyond sustainable impact. We are beginning to see businesses that tackle the toughest, most entrenched social issues of our time – issues that charities aren’t sufficient on their own to handle – and produce strong profits too. These businesses have Super Impact because they are in a position to scale significantly due to their profitably. Their impact is multiplied through franchising and replication across geographies or industries. Their innovation strikes breakthrough that are solving the world’s most difficult problems. While the far upper right may be the holy grail of impact investing, any spot within the sphere provide a good mix of impact and return. There isn’t a “right” answer; the goal is to keep pushing toward sustainable impact in the context of the specific business or charity. LLC, S Corporation, L3C, Benefit Corporation? Every profession has its hazards. For mine, it’s lawyer jokes and requests for free legal advice. This blog contains neither, but it will provide a little education on the basic forms of corporations so you’ll sound smart when you call your own counsel. Some states offer a larger array of options; this blog discusses the most popular entity choices including corporations, LLC, low-profit limited liability companies (L3Cs), and benefit corporations. Should I start a business or a nonprofit? Anytime someone says, “I’m thinking of starting a nonprofit,” my immediate thought is to make sure I can’t talk them out of it. As Dan Palotta points out in his semi-famous Ted Talk titled “The Way We Think about Charity is Dead Wrong”, charities/nonprofits face tremendous headwinds toward scalability. Palotta examined the number of organizations surpassing $50M in revenue since 1970, and found only 144 charities reached that level while 46,136 for-profit companies did. Should I offer investors a SAFE or a convertible note? What’s the difference and is one always better than the other? A convertible note is a type of debt that has the right to convert into equity when a company hits an agreed-upon milestone, typically the next round of funding. If the milestone isn’t hit, the company owes the investors their original capital plus interest. Cite.